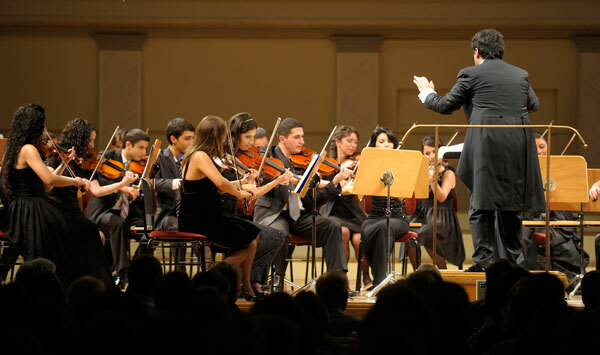 Opera and ballet theatre, one of the main attractions of the city, is located in the center of the three main streets: crossroads of Mashtots Ave and Sayat Nova str. 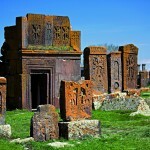 and Tumanyan. Square of the Opera House is a straight rectangle, divided into four parts by the two avenues – Mashtots and Sayat-Nova, one of the most beautiful places in the city. The dense shade of old plane trees and monuments, not having high pedestals, attach warmth and comfort to this part of Yerevan. Opera and Ballet Theatre to the Grand Philharmonic Hall are the main attractions here. The initial draft of the building, executed by Alexander Tamanyan, aimed at the consolidation of winter and summer halls in one volume, separated by scenes of two amphitheatres. In solemn cases, the scenes were connected and turned into one, while the joint hall would hold up three thousand spectators. Design and layout of the theater were presented at the World Exhibition in 1936 in Paris, where it received the “Grand Prix”. However, it was not possible to implement it fully – not possible because of the technique of the time, also the death of A. Tamanyan in 1936 played a significant role here. The theatrical part of the building, in which performances of Opera were acted, was completed in 1939. 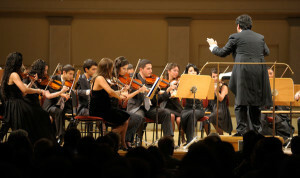 The supplement to the building of a closed volume and the construction of the Philharmonic Hall was completed in 1963 by Tamanyan’s son Georgy, who completed his father’s all works after his death. During the 1978-80, the Opera House and Philharmonic Hall were reconstructed and improved with equipment. 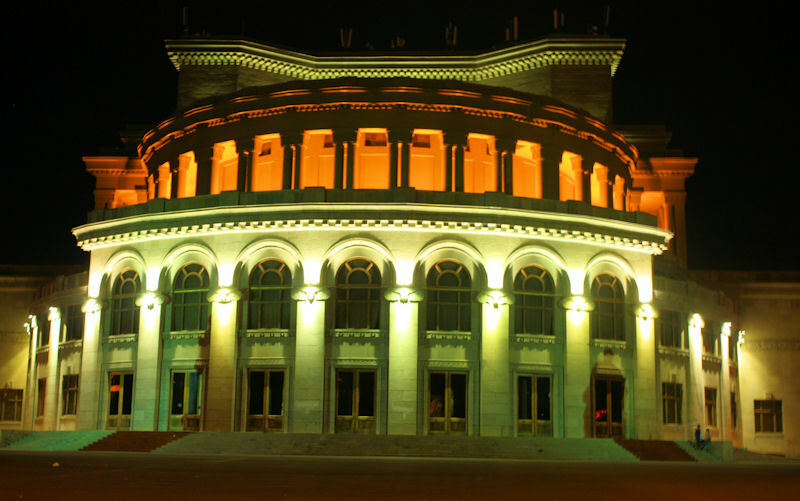 The Philharmonic Hall is named after famous Armenian composer, Aram Khachaturian. 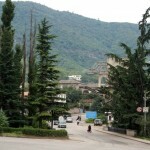 In front of the concert hall stands the monument to Aram Khachaturian (architect Yu. 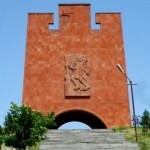 Petrosyan), erected in 1999 on the occasion of his birthday. This accolade to the great composer completes the monumental panorama of the adjoining Theatrical Square. The interiors of all spaces have been redecorated with a rich range of Armenian marble and precious woods, new chairs have been installed in the halls, the chandeliers and lamps were replaced. The theater got modern mechanisms for the scene; an original construction of lifting floor of the orchestra pit can raise it now more than two meters and increase the proscenium. Granite cladding of the building walls up to parapets and mask bas-reliefs on the capitals of the columns brought its exterior closer to the one the author planned. 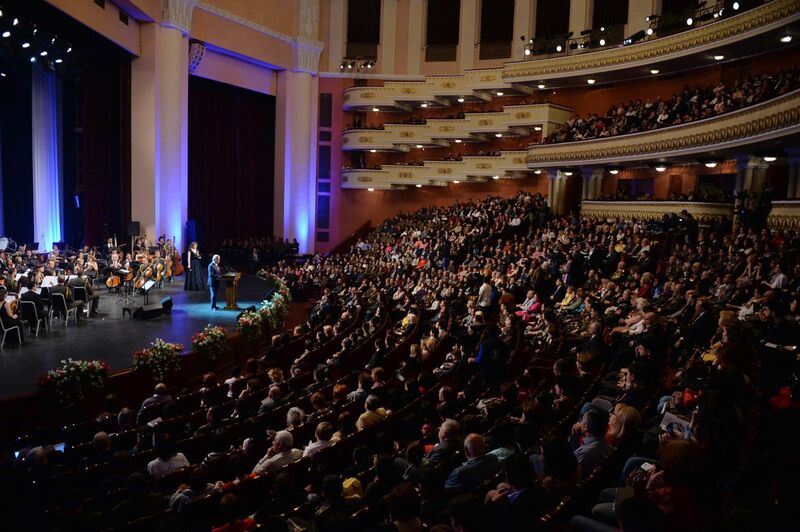 Today, the Opera and Ballet Theatre holds 1,260 people, and the Concert Hall holds 1,400. Like any talented work, the project of Opera House had many interesting, but unimplemented plans. For example, one of them was an unusual floor in the interior of the lobby of the theater. This floor, which is also the ceiling of the pantry, located in the basement, was supposed to be of glass and double-layer. The layer serving as floor of the lobby, had to imitate an Armenian rug in the technique of lying horizontally of stained glass. The author imagined the layer ceiling of the pantry made of cream-colored glasses. Between the layers there would be placed lamps, illuminating the lobby below, in the form of lights, and giving scattered coverage of the pantry. In front of the main entrance of the theater is located Freedom Square, also called Liberty Square. 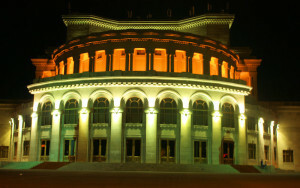 It is the heart of Yerevan right between Cascade and Republic Square. Currently, significant statues of Hovhannes Tumanyan (sculptor A. Sargsyan), a beloved Armenian poet and Alexander Spendiaryan (sculptors G. Chubaryan and A. Sargsyan), the famous composer, stand in the Freedom Square. Northern Avenue is built between Opera and Republic Square. There is a large park around Opera, which contains Swan Lake, and over a dozen very popular outdoor cafes. The surrounding areas hold statues and monuments too. There is a small park not far from the Freedom Square, in front of the Yerevan State Musical Conservatory named after Komitas Vardapet. Statue of Komitas (sculptor A. Harutyunyan) is situated right at the main entrance of the Conservatory. Komitas was an Armenian priest, composer, choir leader, singer, music ethnologist, music pedagogue and musicologist, who lost his mind after witnessing the 1915 Armenian Genocide and is ranked among the Armenian martyrs of genocide. The opposite of the square is remarkable monument of painter Martiros Saryan (sculptor L. Tokmajyan), carved out of the monolith of white marble of the Urals. It has become almost year-round exhibits of painters. On Saturdays and Sundays, there are exhibition and sale of paintings, as in the Montmartre in Paris or Prague.